It was stunning to see how and where the water rose, so when our electricity was restored, we decided to add the high water mark to our map of energy resources. View it at OpenGreenMap.org/nycenergy. 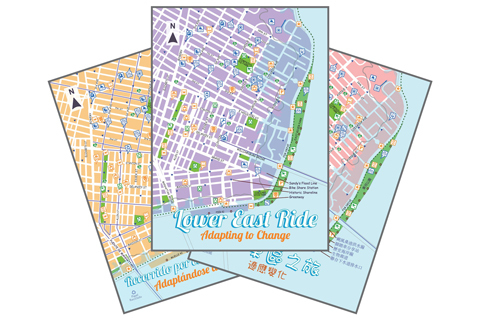 We also produced "Lower East Ride Green Maps" to help introduce the then-new bikeshare program and promote cycling as an everyday climate change countermeasure (download in English, Chinese and Spanish). Bike Ready, our preparedness for bicyclists video was produced in 2016 in 4 languages, English, Chinese, Spanish and Japanese. 2017 - 2018's climate actions include development of a community resiliency lab and matching the global Green Map Icons to the UN's 2030 Goals. As you probably know, Sandy has become a broad call to action for a more resilient approach to planning for climate change. We developed a dynamic slideshow on the evolution of our own local climate-themed Green Maps, including the Creative Climate Action Award we won in fall 2013, and some of related editions by global Green Mapmakers. As noted in our Post-Sandy newsletter, on Dec 2, 2012, we held our first "Adapting to Change" Cycling Tour. Riders explored resilient solutions that reduce energy consumption and increase climate awareness - see some of the speakers below. This ride built upon our prize-winning ’10 Days of Climate Action’ Tour which included several sites from our interactive Energy edition. You can download the original 2006 version of this map under Info on the right sidebar, too. Our tour drew diverse participants as well as press coverage in Bowery Boogie and a Play and Ideas post by Benjamin Heim Shepard. • In January 2013, we gave a walking tour as part of the Municipal Art Society's Road to Resilience Forum, which was covered by Untapped New York. • We dug in deeper on our March 2013 Adapting to Change cycling tour/discussion, and quite literally, supported community resiliency and sustainability as we pitched in on the then-new Siempre Verde community garden. • In partnership with East River Park's Partnerships for Parks Greenway Catalyst, the next phase of this project launched in May: Lower East Ride which includes new printed and interactive Green Maps linked above. Thoughtfully designed by Maryam Khabazi, with Bethany Bingham and Aaron Reiss, we have now printed the third edition of this map. • Our discussion rides continued with several annual Climate Week NYC events. This project won an award through the 10 Days of Climate Action program, and drew New Yorkers and visitors from several countries. • We produced a video to encourage more involvement: How to Make a Green Map Cycling Tour is now online in English or Chinese! See it below. • We joined LES Ready, the long term recovery group in our community. We show up and take part in many different kinds of climate resiliency efforts in NYC, as well. • Placemaking: 2017's climate actions include developing a strategic plan for a community resiliency lab at the Stanton Building, in partnership with local organizations. Ideally, its doors will open in 2020. • 2018's actions include taking part in the launch of LESReady's new guide and Public Lab's Crisis Convening, as well as our own #AnimateChange campaign! • As evidenced by our new open policies, the urgency of climate change is directing us toward a new way of working! We're taking part in other climate forums and generating new ways that Green Map projects, locally and globally, can help shift the balance toward a climate smart and healthy common future. Support this work by donating any time, or contact us about getting involved. Best wishes from Wendy Brawer and our New York staff. Video include "Bike Ready" and from 'Adapting to Change Cycling Tour' series, presented as a 'how-to' for extending beyond mapmaking and generate new solutions for the community's future. See it in Chinese and with its English guide, here.